Join us twice a year (in July and January/February) for the Toastmasters Leadership Institute (TLI). Officers can attend Club Officer Training (COT) during that session. Club Officer Training, Educational Sessions, & More! 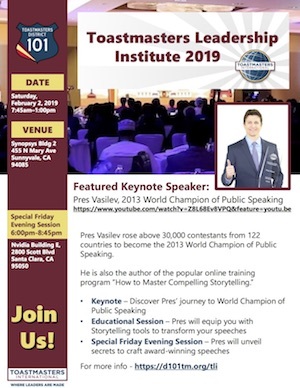 Witness the twists and turns, the defeats and triumphs, the decisions and discoveries that shaped Pres Vasilev’s journey to World Champion of Public Speaking. You will pick up powerful public speaking tools, tactics and techniques. In this session, Pres Vasilev will equip you with the storytelling tools you need to transform your speeches into captivating stories. You will walk away with practical tools that will help you uncover the glory of your story so you can influence and inspire your audience. In this storytelling workshop, Pres Vasilev will unveil secrets to craft award-winning speeches. Attend this separate workshop for a chance to be coached on your speech, and enrich your public speaking and leadership skills with the great art of compelling storytelling. If you would like to volunteer for this event, contact our Program Quality Director Pavan Datla at quality@d101tm.org.